A monthly publication centered on the Word of God. Drawing inspiration from a multitude of voices, Give Us This Day provides a relevant and trustworthy understanding of Scripture. Simple, elegant design with full-color covers and two-color text pages. Beautifully printed on responsibly sourced, high quality paper. Trim size 4.5" x 7"
Trim size 5.75" x 9"
Intuitive navigation and calming, prayerful design. 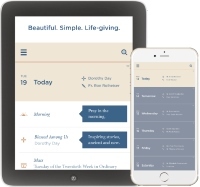 Multiple-copy subscriptions (mailed to a single address) are ideal for parish groups, staff, leadership, RCIA, and many others. Draw your community closer to God, and each other, through morning and evening prayer, daily reflection, Mass texts, inspiring profiles of holy witnesses, and so much more. All prices are per subscription and include shipping to a single address within the United States. Additional shipping charges will apply to subscriptions mailed outside of the United States. 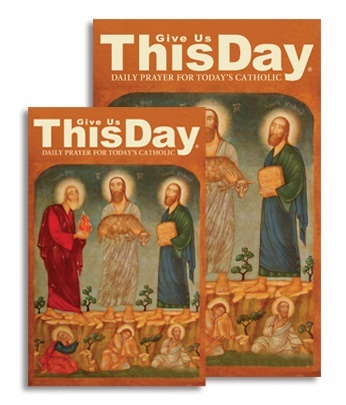 Renew online to ensure your subscription to Give Us This Day continues without interruption. Click the button below, login to your account, select “Renew” and that’s it! Don’t have an account? Creating one is fast and easy. Click the button below and follow the prompts for creating a new account. Your issue is mailed almost 6 weeks prior to issue date, so renew early and don’t miss a single copy.